We wrote earlier Friday about Texas A&M’s weekend rotation carousel in the weekend preview, and the Aggies sent sophomore righthander Brigham Hill to the mound against a Mississippi State club that tends to smack around any bad pitches. Well, Hill put together a gritty outing in a 10-3 win over the Bulldogs, striking out eight, walking two and allowing two runs on seven hits in 6.2 innings of work. Meanwhile, this was a close one most of the way, with the Aggies pulling away with a six-run top of the ninth. 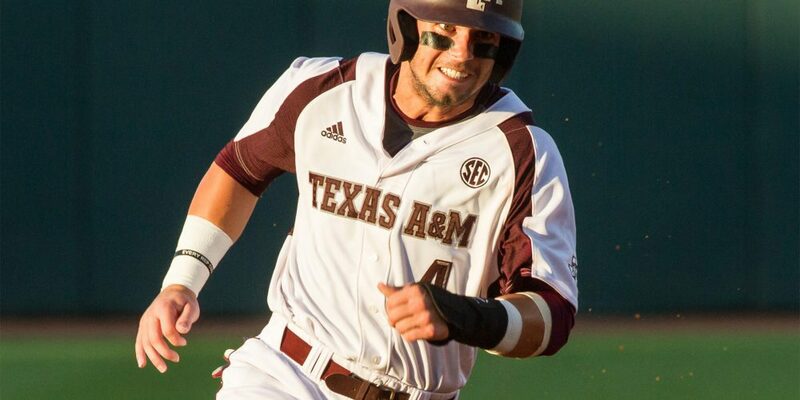 All-American outfielder Nick Banks, who has been very up and down so far this spring, was a monster in this one, smacking two doubles, and penning the exclamation point with a ninth-inning grand slam. For the Bulldogs, prized junior righthander Dakota Hudson certainly had his bad moments against the Aggies, but gritted his way through seven innings, striking out eight, walking one and allowing four runs on 10 hits in seven innings, throwing 101 pitches, 71 of them for strikes. 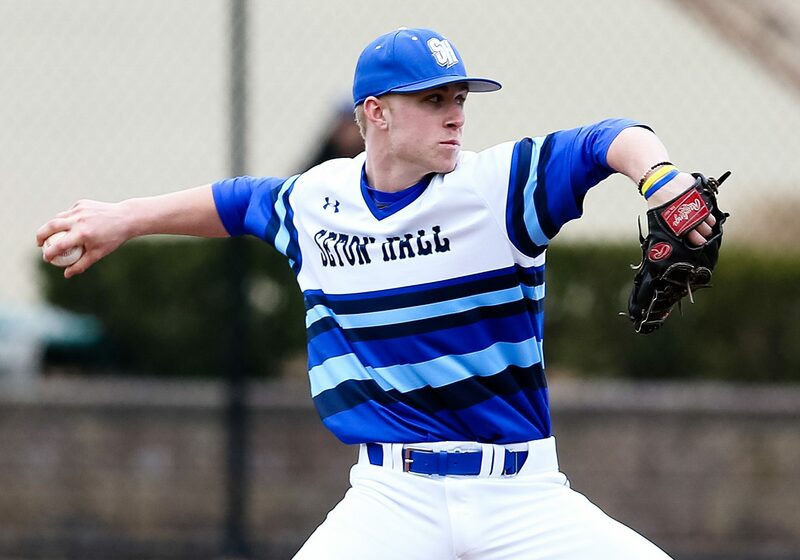 Seton Hall needed a boost Friday night and got exactly what it was looking for in a 10-0 win over LIU-Brooklyn, and even more importantly, it got the first perfect game in school history in a gem twirled by sophomore righthander Shane McCarthy. The 6-foot-2, 190-pound, talent struck out eight, and amazingly, needed only 88 pitches get through the complete game affair, throwing 69 of them for strikes. 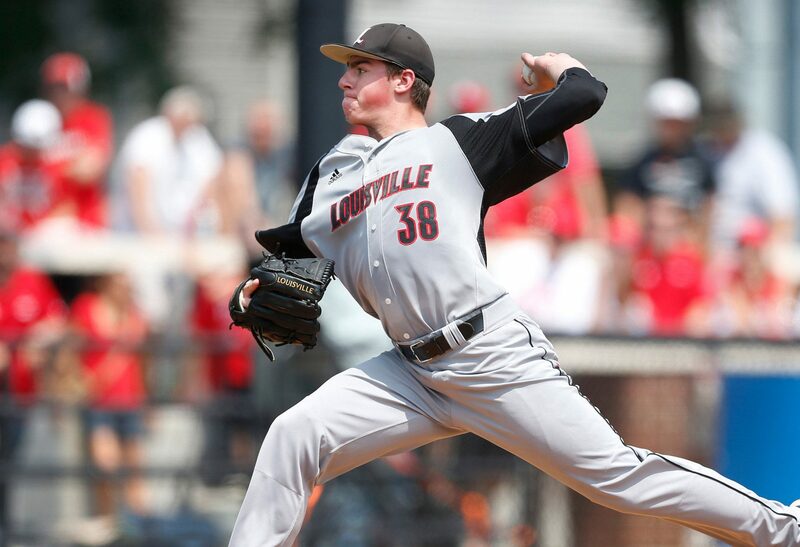 With his eight strikeouts, McCarthy is up to 57 for the season and now ranks second in the Big East in the category. Here’s a special D1Baseball.com tip of the cap to the Seton Hall righty. It hasn’t exactly been the inaugural season Marty Lees was looking for at Washington State, but his club showed some real toughness Friday night in a 7-5 win over No. 7 Oregon State. The Cougars got the decisive blast in the seventh inning when freshman outfielder Mason Cerrillo connected on a grand slam to give the Cougars a 7-4 lead. WSU’s pitching staff was able to take care of the rest. WSU righthander Ian Hamilton allowed four runs on two hits in six innings, while reliever Ryan Walker allowed a run on two hits in three innings of work. On a side note, with Oregon State, California and Stanford all losing, the Pac-12 remains a mess with, you guessed it, Utah, at 12-18 overall, leading the league standings. • TOP SPOT, NO PROBLEM: Though it’s just the first game of the series, Miami sure put on a show in a 14-2 road win over previously red-hot Duke. Hurricanes outfielder Willie Abreu had a huge night with a pair of doubles and three RBIs, while young second baseman Johnny Ruiz went 2-for-2 with a double and four RBIs. Meanwhile, Miami lefty Thomas Woodrey allowed just two runs – one earned – on six hits in six innings, while heralded Duke righthander Bailey Clark was lifted after allowing four runs in three frames. • THE GAEL OF THE BALL: Eric Valenzuela and his coaching staff have done a terrific job with the program this spring, and they took another step forward Friday night by clinching a series win over sizzling BYU with a 7-4 victory. Anthony Villa hit a home run in the contest, while Nate Nolan went 4-for-5 with a pair of RBIs, and Johnny York put together a quality outing, allowing just three earned runs in 8.1 innings of work. St. Mary’s RPI continues to climb and this team is gaining some serious steam on the national stage. • CAJUNS CAGE THE LIONS: Louisiana-Lafayette lefthander Gunner Leger has a nifty ability to tame teams, and he did so in a 4-1 win over Southeastern Louisiana. Leger allowed just one hit in seven innings, while Eric Carter and Dylan Moore closed out the contest, with Moore earning his eighth save. For the Lions, stud lefty Kyle Cedotal allowed four runs – three earned – on eight hits in 6.1 innings. • ALL THE RIGHT CARDS: My goodness, you won’t find a much more dominating performance than that put together by Louisville in a 15-2 win over Clemson. Not only did the Cards score those 15 runs, but they outhit the Tigers 20-2 in the process. Leadoff hitter Corey Ray had three hits to help spark an offensive onslaught, while Blake Tiberi hit a home run and knocked in four runs, and Brendan McKay helped his own cause on the mound by collecting three hits and knocking in two runs at the plate. On the mound, the lefthander struck out eight, walked four and allowed two runs on two hits in seven innings. Meanwhile, it was an ugly night for Clemson’s Clate Schmidt, who allowed five runs on 10 hits in just 2.1 innings. • HARP’S ON FIRE: Now, here’s something you don’t see every day. So, Sam Houston State scored 35 runs in two games in a doubleheader sweep of Incarnate Word. Well, outfielder Clayton Harp only played in a pinch hit role in the first game, only to come back in Game Two and go 7-for-7 with three doubles and five RBIs. Speaking of the Bearkats, they are now 20-16 overall, 13-4 in the Southland Conference. • HELLRAISIN’ HAYMES: Gardner-Webb took total control of High Point 9-0 to begin that interesting Big South series, and Bulldogs righthander Brad Haymes led the charge, striking out 12, walking one and allowing four hits in a complete game performance. • BELIEVE IN THE BIEBS: No, of course we’re not talking about the singer, we’re talking about the UC Santa Barbara veteran righthander, Shane Bieber. The righty struck out seven, walked one and allowed four hits in a complete game shutout performance, 1-0 win over Cal State Northridge. • COMFORTABLE CAMP: It hasn’t been a great first season for Auburn head coach Butch Thompson, but they got a bright spot Friday night in a 2-0 win over Tennessee. Veteran Justin Camp struck out seven, walked one and allowed just two hits in the complete game performance. Speaking of the Tigers, outfield sensation Anfernee Grier had two more hits on the night. • YOU SERIOUS, CLARKE? South Carolina sophomore righthander Clarke Schmidt has been one of the better stories in college baseball this spring, and he continues to a dominant force in the SEC. 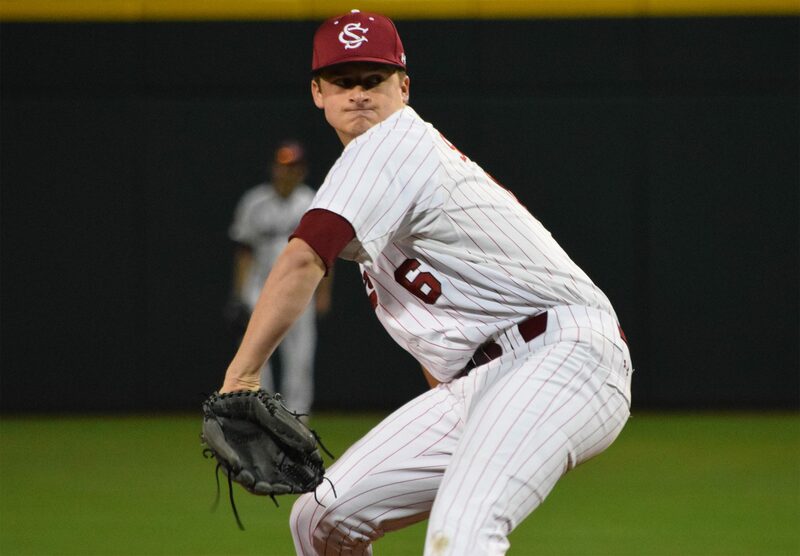 Schmidt struck out 10, didn’t walk anyone and allowed just a run on five hits in a complete game performance, 3-1 victory over Georgia. Meanwhile, Georgia righthander Robert Tyler scuffled, allowing three runs in just 3.1 innings. For the year, Schmidt now has a 1.66 ERA in 65 innings, along with 80 strikeouts and 10 walks. • SHEFF DOING THE COOKING: Vanderbilt has had a tumultuous past couple of weeks, but responded in impressive fashion Friday night with a 3-0 win over Kentucky. Vandy righthander Jordan Sheffield was electric, striking out 14, walking just two and allowing five hits in a complete game performance. He also threw 124 pitches, 82 for strikes. • HOGS BEING HUNTED: The Hogs have one of the more impressive NCAA postseason streaks in the country and that’s in serious jeopardy right now, as the Hogs dropped to 4-10 in the SEC with an ugly 9-2 loss to Florida. Five Gators hitters had multi-hit games, while Arkansas righthander Keaton McKinney only lasted four innings with righty James Teague coming out of the bullpen and allowing five runs in just 1.1 innings. On a side note, UF righty Logan Shore had a Shore-esque night, striking out four and allowing just a run on seven hits in 6.2 innings. Arkansas, in addition to the awful conference mark, has an RPI of 120 with a 2-10 mark vs. RPI Top 50. • DOING THE CANNING: UCLA has had what could be best describes as a nightmarish season thus far, and perhaps a win over Washington on Friday will get this team headed the right direction. In the 1-0 victory, righthander Griffin Canning was terrific, striking out 10, walking one and allowing just six hits in a complete game performance, while also throwing 126 pitches, 84 for strikes. • DESERT KING: Arizona got its weekend series against Stanford off on the right foot with a 4-1 victory on Friday. Stanford freshman Tristan Beck put together a quality start, allowing just a run on three hits in five innings, but was overshadowed by Wildcats senior righthander Nathan Bannister, who struck out five, didn’t walk anyone and allowed just a run on five hits in a complete game performance. • FUN TIMES IN BIG TEN: It was a fun night in the Big Ten Conference, as Michigan beat Nebraska 10-6, Minnesota beat Maryland 9-5, and Michigan State ace pitcher Cam Vieaux had a big night in an 11-0 win over Purdue, striking out four, not walking anyone and allowing nine hits in a complete game performance. As for Michigan, Carmen Benedetti had two hits and three RBIs, while for Minnesota, it was led by a seven-run eighth inning with leadoff hitter Dan Motl collecting a triple and two RBIs and three-hole hitter Matt Fiedler smacking a pair of doubles. • JACKETS GET PACKED: N.C. State has somewhat quietly been a very, very solid team over the past few weeks. Well, the Pack earned a nice 8-3 victory over Georgia Tech to begin the weekend, scoring four runs in the top of the ninth inning to solidify the victory. Preston Palmeiro and Josh McClain each had a double and two RBIs, while on the mound, righthander Cory Wilder struck out five and allowed two runs in five innings, while Will Gilbert did an admirable job out of the bullpen.